As a baseball fan, no matter how bad the team you root for may be, the All-Star Game is the best. As a White Sox fan, I haven’t experienced many really bad seasons in my lifetime. As I’ve written in previous posts, this has not been a good year for my White Sox. And, as a Sox fan, it feels like the sky is falling. Come the ALL-Star break, I try to forget about my team’s struggles, and look forward to the Summer Classic. So, I’d like to focus on a positive note this time around. Chris Sale. Man is he good. While young star pitchers like Matt Harvey, Clayton Kershaw, and Stephen Strasburg get a lot of publicity (and rightfully so), Chris Sale doesn’t receive much of the spot light. And that seems to suit him just fine. Though when the spot light shined its brightest at the MLB All-Star Game last Tuesday night at Citi Field, Sale stepped to the mound for 2 innings of perfect baseball. There’s just something about a player from YOUR TEAM playing in the MLB ALL-Star Game. Granted, every team is allowed at least one ALL-Star every year, it’s still fun to see your team’s colors represented on the field. When your team’s ALL-Star enters the game, it makes you feel proud. In the case of Jesse Crain, the White Sox second ALL-Star representative, he wasn’t able to participate due to injury. But you better believe he still had fun. So when Chris Sale entered the game on Tuesday night, and pitched a perfect two innings, as a White Sox fan, I couldn’t be prouder. Sale’s herky-jerky motion is hard for any hitter to pick up, let alone a left hander. Good left-handed hitters such as Joe Mauer and Robinson Cano have been rendered useless against the likes of Sale. And I’m sure Mauer was happy to be catching Sale rather than facing him in the batter’s box. While the night belonged to Mariano Rivera, and, in the first inning, Matt Harvey pitching in front of his hometown Mets fans, the best pitching performance belonged to Sale. Although I’m not a proponent of the ALL-Star Game dictating home field advantage in the World Series, the idea has to make some players take the game more seriously. You don’t think Joe Nathan was pumped in the ninth inning with the chance that the 3 outs he was trying to get, could give his team (the Texas Rangers) home field advantage in the World Series? Of course he was. But, do you think Jesse Crain or Chris Sale would have cared as much as Nathan? But you’d be hard pressed to find a single player who didn’t have fun. Just like Jesse Crain, excited to be named to the team, yet unable to play due to injury. And that’s what ALL-Star Weekend, not to mention the game of baseball, is all about, having fun. From the Home Run Derby to the Futures Game, the entire weekend is about fun. Whether you’re a fan, or a player, or a manager, if you’re not having fun during ALL-Star Weekend, something’s wrong. Sale got to interact with AL Central rival Tigers manager Jim Leyland during the course of the week’s events. Just a week prior to ALL-Star Weekend, Sale and the Sox had an altercation with Leyland’s Tigers. Sale threw behind Prince Fielder, resulting in Alexei Ramirez being hit the next inning. Benches cleared, but cooler heads prevailed. Sale and Leyland were able to talk about the incident, and, apparently, mended some fences. Since the break, the Sox and Tigers have squared off twice, with the Tigers winning both. Game 1 featured Sale and Max Scherzer. Scherzer got the better of the matchup with the Tigers prevailing, while Sale threw 8 innings, allowing only 2 earned runs. This has been an all too common occurrence for White Sox starters this season. Good pitching performances (Quality Starts, a statistic I like a lot), but not enough run support. One thing is for sure, Chris Sale has a very bright future. How bright the organization’s future may be is yet to be determined. With seemingly everyone a possible trade candidate (everyone except for Sale and Paul Konerko, according to Sox GM Rick Hahn), the Sox hope to acquire some young talent via trades, something the organization is lacking. 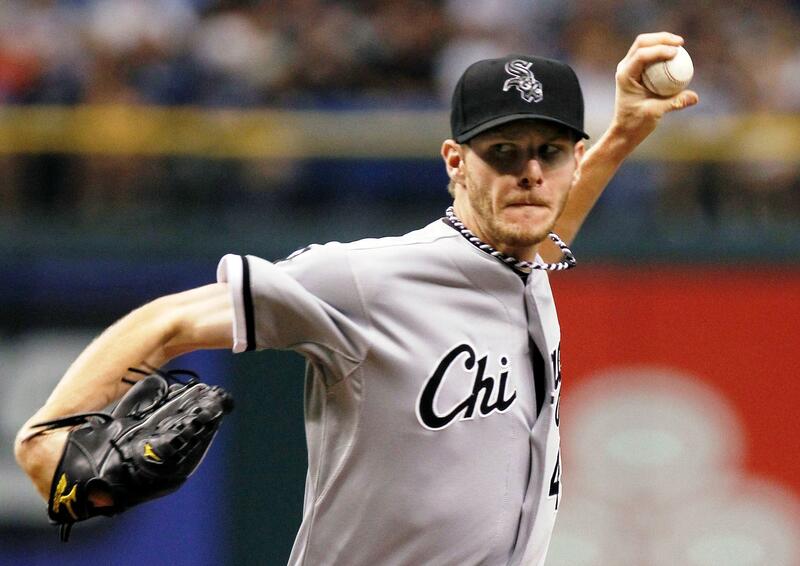 We as Sox fans can only hope that the young talent acquired, will be as good as Chris Sale. Besides Konerko in this picture, all other guys could be traded that were on the 2013 Opening Day Roster, with the exception of Sale also. Rios has been linked to a team like Pittsburgh, Addison Reed to possibly Detroit, LA Dodgers or Boston. Jake Peavy even has to be considered with such a limited market for Starting Pitchers. Dunn could be dealt to a team like Baltimore for a DH, or New York for a 1B/DH/. Jeff Keppinger could provide long term versatility for a team like New York, Boston or the LA Dodger at a cheap price for a contact hitter with a .282 Career BA. 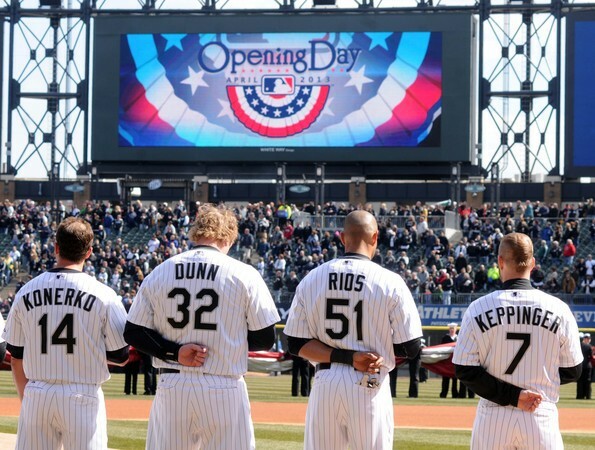 It is unlikely the 2014 Opening Day Line will resemble anything much from the 2013 squad. Posted on July 25, 2013, in MLB Teams: Articles and Analysis, The Rest: Everything Baseball and tagged 2013 All-Star Game, @brianm731 on twitter, addison reed, alex ríos, alexei ramirez, boston red sox, Brian Madsen, chris sale, clayton kershaw, detroit tigers, jake peavy, jeff keppinger, jesse crain, Jim Leyland, joe mauer, joe nathan, mariano rivera, matt harvey, max scherzer, new york yankees, paul konerko, prince fielder, rick hahn, robinson cano, stephen strasburg, white sox. Bookmark the permalink. Leave a comment.